Another great book review for you guys today! I have been reviewing a ton of books lately and not all of them are my style of books, but this one is right up my alley! These are the kind of books that I really like to read! This one, The Humanity Of Justice, is a true-crime book as told by a veteran prosecutor. 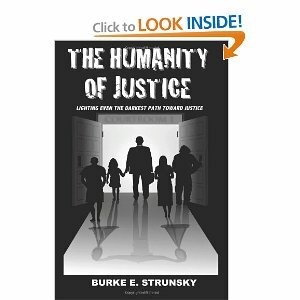 Mr. Strunsky tells all about some of the most chilling and haunting cases the US Justice system has ever seen, and takes you right inside the courtroom. I learned so much from the book. Not only were the cases gripping and compelling, but I learned a lot of criminal justice facts, and terms, etc. It was really interesting to me to learn all of this while also being entertained by the stories themselves. What I really liked about the book, aside from the actual stories and cases, is the commentary that Mr. Strunsky has throughout the book. You can tell that he truly cares about the people in these cases and that he really has an emotional involvement in these stories.It was really intriguing to read about the people behind the cases, and the thought processes that go on inside the minds of the people who are on the other side of the defendant. The best part of the whole book is that 100% of the proceeds will be donated to The Humanity Of Justice Foundation, that helps prevent child abuse and neglect. Burke E. Strunsky is a senior deputy district attorney working in Riverside County, an hour east of Los Angeles. His office has one of the highest conviction rates in California, is the fourth largest in the state, and the fifteenth largest in the nation. The author specializes in homicide cases and crimes against children. His tenacious work ethic and impassioned attitude in the pursuit of pedophiles and murderers have earned him great respect and recognition in his field. In 2009 and 2011, the author was named Prosecutor of the Year. He has prosecuted defendants in extraordinary criminal cases that have been featured on national TV shows.